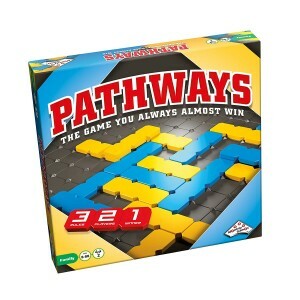 Pathways is an exciting two player board game. Each player takes it in turn to place a tile of their colour on the board. Player one needs to try and make a connecting line across the board in blue tiles whilst player two is trying to do the same using yellow tiles. With it only being 18 tiles from onw side of the board to the other you are never far from victory. Pathways comes withfree delivery.